Decking out a nursery for your infant requires a lot of consideration. Your child is the most important thing in your life and you want to ensure that the nursery has the maximum combination of safety and comfort, as well as the greatest ease of use for you as a parent (especially given you might be a bit sleep deprived!). 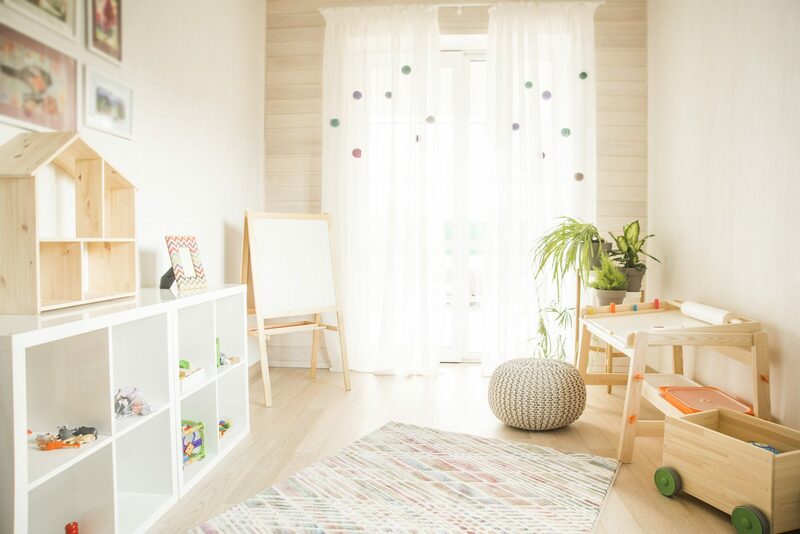 Selecting the right window treatments for your nursery takes a lot of thought, so the team here at Modern Blinds has a few tips for you to consider. H2: Make Sure Your Kid Can’t Grab the Curtains! Especially if you have a mobile toddler in the nursery, it’s important to make sure that things like curtains, blinds, and their associated cords are well out of reach. Not only can the toddler do a bit of damage to the curtains themselves, but they might severely injure themselves by pulling the curtains on top of them, or getting tangled in the cords. It’s better to have elevated windows, and blinds and cords that are well out of reach. If your blinds don’t comply with the current Child Safety Laws Call Modern Blinds to discuss child safety devices that are supplied on all Modern Blinds that have cords. It might indeed be preferable to use a sturdier shutter like a Vogue Shutter, rather than curtains or blinds. These can be kept firmly shut and the light levels easily adjusted, making them less susceptible to prying little hands! It’s a good idea to have a consistent colour scheme in the room that is both recognisable and comforting to your child. Many people think blue can have a calming influence, and that soft reds and pinks can increase feelings of cosiness. For toddlers in particular, it might be fun to include decorative patterns or themes to inspire their imagination. A nautical theme, a train theme, a fairy them or wizard theme might inspire your child’s imagination and turn their nursery into a place of comfort and wonder. At Modern Blinds, we offer customisable options, and we will work hard to actualise the theme and decorative scheme that is best for your child. Infants and toddlers don’t have the ability to regulate their own heat as well as adults do, and they can’t adjust curtains and blinds themselves. It’s important to make sure that your nursery has proper insulation that prevents the room from overheating or getting too cool. Heavier curtains and blinds do this well. But it can also be achieved through sun-reflective, external shutters or awnings. You can even automate and motorise your shutters or awnings to open and close at specific times during the day, removing any chance that you forget. Proper insulation will ensure that your child has a great sleep and stays in good health. Safety first! With over ten years of trading and servicing in the Queensland area, the team at Modern Blinds know all the ins and outs of window coverings adapted to the Queensland climate. Contact us today to find out how you can improve the comfort, safety and usability of your child’s nursery.